First, a few maps to locate these tributaries as they empty into the James River in Virginia, then the commentary from a number of sources. Notice where Jamestown, the earliest settlement, is in relation to these waterways. The map is from Mary McCarthy’s book, Virginia Adventurers and Immigrants 1607-1624. “Shortly after establishment of the settlement at Jamestown in 1607, English settlers explored and began settling the area…Captain John Smith in 1608 crossed the James River and obtained fourteen bushels of corn from the Native American inhabitants, the Warrosquyoackes or Warraskoyaks. They were a tribe of the Powhatan Confederacy, who had three towns in the area of modern Smithfield. The Warraskoyaks were driven off from their villages in 1622 and 1627, as part of the reprisals for the Great Massacre of 1622. I have a great deal of information about this time period which I will post elsewhere. Here I am focused on Chippoakes and Lawnes Creek and Blackwater. 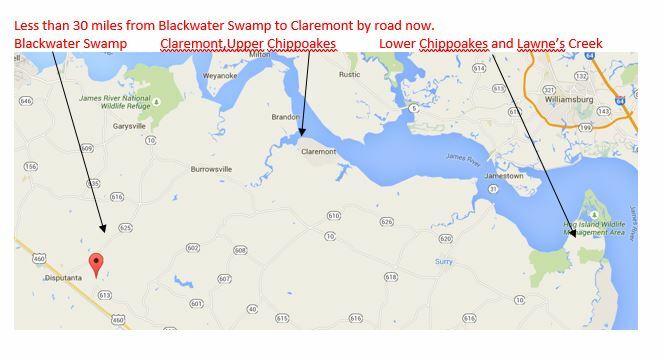 “The site of the town of Claremont (Claremont Plantation, which was built by our ancestor, Arthur Allen, gt), across the James River from Jamestown, was explored by Capt. John Smith as palisades were being built on the island. 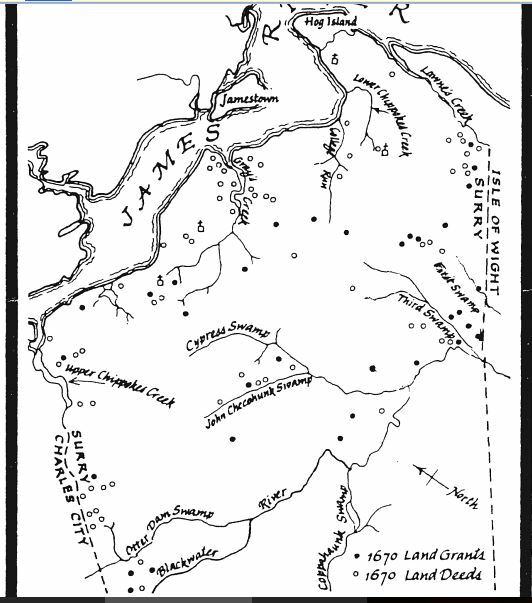 Smith described meeting the Indian chief on the south side of the river, climbing the “mountain” above the shore, and the straight rows of corn under cultivation by the “Chippoacks” Indian tribe. Tribal boundaries were the Upper and Lower Chippokes creeks. “Plantations were quickly seated along the Upper Chippokes. The loss of Virginia Company records leaves uncertainties, but many owners are identified in the census of 1624, in land grants that often trace renewed patents to the original owner, and in wills found in England. “The first English plantations along the south shore within present-day Isle of Wight were established by Puritan colonists, beginning with that of Christopher Lawne in May 1628. Several members of the Puritan Bennett family also came to settle the area, including Richard Bennett who led the Puritans to neighboring Nansemond in 1635, and later became governor of the Virginia Colony. Some of our Ancestors came with Bennett and also moved with him to Nansemond. “The first English settlement in Isle of Wight county was made by Capt. Christopher Lawne (for whom Lawne’s Creek is named) and Sir Richard Worsley, knight baronet, and their associates, vis. : Nathaniel Basse, gentleman; John Hobson, gentleman; Anthony Olevan, Richard Wiseman, Robert Newland, Robert Gyner, and William Wills. We will find this Basse, gentleman, in connection with our ancestors. “Capt. Lawne and Ensign Washer represented the settlement known as Lawne’s Plantations in the first House of Burgesses, which met on the 30th day of July 1619. Within a year Capt. Lawne died. “It also declared that the plantation was to be henceforth called Isle of Wight Plantation…” Its former name had been variously spelled Warrosquoyoke, Warrosqueak, Warrasquoyke, etc. and was often called that for a number of years before the new name became well known. The ship Sea Flower had been captained by one of our relatives in trade in the East Indies. That ship is not be confused with a similarly named ship that wrecked off the coast of Bermuda in 1609. That reference will be in another post. “…On the day the patent last mentioned was granted, Arthur Swaine, Capt. Nathaniel Basse and others undertook to establish another plantation in the same neighborhood. Capt. Basse came over in person and his plantation was known as ‘ Basse’s Choice,’ and was situated on Warrosquoyacke (now Pagan) River. One of the survivors of the big Indian massacre was a man named Pace, who was associated with our relatives. Among those who had died was Mr. Robert Bennett, the brother of Edward Bennett, the rich London merchant, and first minister Mr. Wm. Bennett, doubtless one of the same family. Richard Bennett lived and would soon move with many of our relatives to Nansemond County. “…From the beginning of 1626 the colony entered upon a more prosperous era, and from then on a continuous stream of emigrants were granted patents. 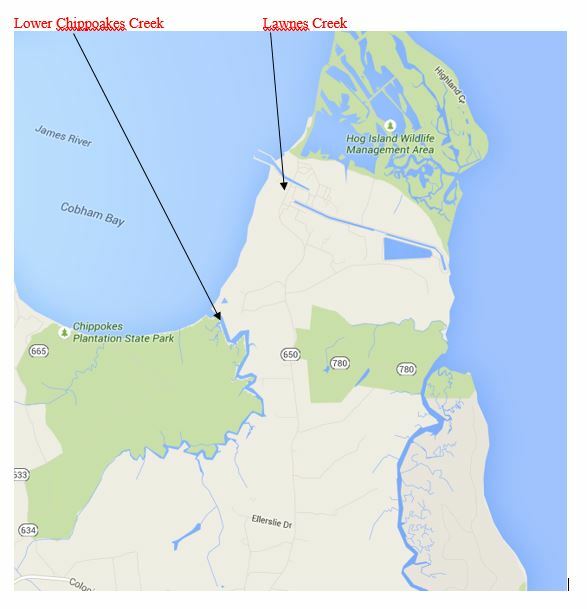 While early acts also described a Chippokes Parish, it seems to have been absorbed by Lawne’s Creek. An Act of March, 1643, relieved the inhabitants of the burden of supporting James City Parish, because they were living within Lawne’s Creek Parish.. .
Southwark Parish was created in 1647 and described as encompassing all the territory extending from “the colledge” [College Creek] to (and including) the Upper Chipoaks [Upper Chippokes Creek]. Surry County was cut off from James City County in 1652, and Lawne’s Creek and Southwark Parishes then lay within it. In 1652 Surry county was created out of that part of James City south of the James and thus included the parishes of Lawne’s Creek and Southwark. Brunswick County was created in 1720 with portions of Isle of Wight and Surry Counties falling within its bounds. Portions of Lawne’s Creek and Southwark Parishes thus became part of St. Andrew’s Parish in Brunswick County. I will be posting more material with links back to this post. William Waller Hening, The Statutes at Large…, vol I (Charlottesville, 1969) 277 cited by Cocke.